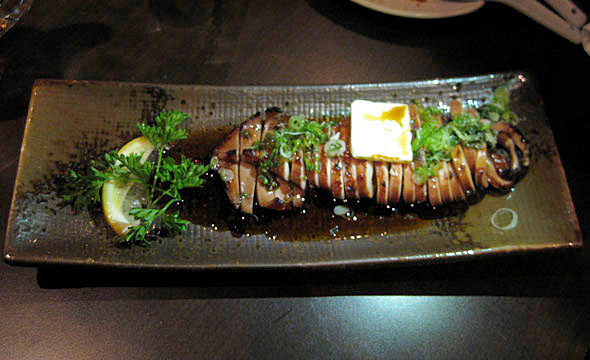 Fin Izakaya, a newish gastro-pub near Yonge and Eglinton, entices diners with an extensive menu. 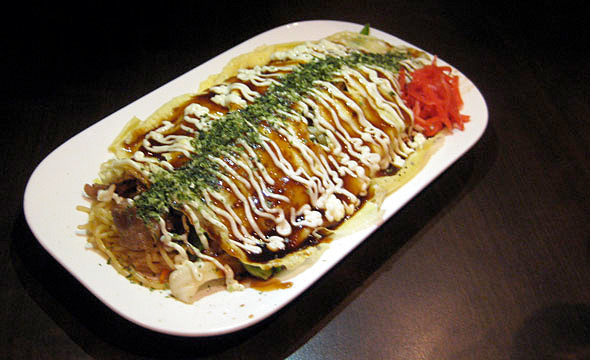 In Japan, as it does here, izakaya means "place for sake", and references casual pubs serving high-end snacks. Fin Izakaya's tempting, picture-heavy menu summarizes the concept by scrawling "tapas" across several categories of selections. Ranging from fresh vegetable salads and pickled kimchis to sashimi plates and wagyu hotpots, the artful menu promises enough flavour to excite any sample-happy gourmand. Passing up the whimsically named "Asian Tofu Fight" (a selection of Japanese, Korean and Chinese tofu) and a disturbing number of shark-fin based dishes, my dining partners and I order a selection of traditional izakaya fare: Wakame Salad, Ika Sugata Yaki, Kakuni Pork, and Yakisoba. Wisely, considering Toronto's love affair with sushi, Fin breaks with izakaya tradition by offering a decent selection of sashimi and rolls, so we order a Tuna Tataki, plus a pitcher of Sapporo to wash it all down. I'm hesistant to pass up Fin's creative cocktail menu, but izakaya is all about sharing, so I defer to my friends. 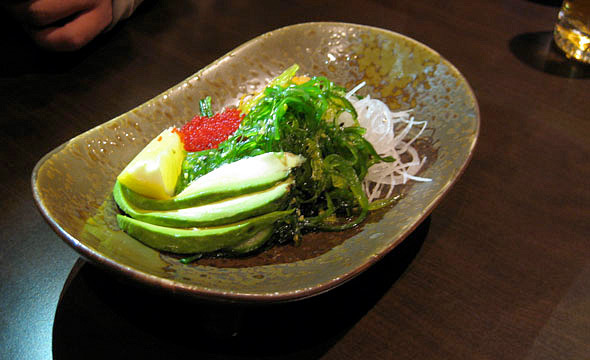 Our meal starts on a high note with Wakame Salad, firm jade ribbons of fresh seaweed, sweet slices of avocado, crisp daikon and popping roe in a pucker-kiss vinaigrette. Tongues-a-tingling, we devour the plate by the time the Tuna Tataki arrives. Seared at the edges, each slab of ahi tuna appears deliciously rare and moist in the centre. 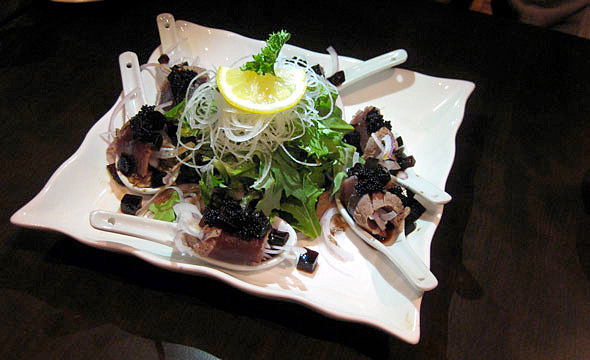 Although the menu displays the tuna resting next to thin curls of Spanish onion, we find the onion has migrated nearer, serving as filling for the rolled tataki, which are also topped with thick black roe and cubes of jellied ponzu. Unfortunately the combination is too much: the sharp onion and pungent ponzu overpower the ahi, and relegate the prime attraction to mere wrapper status. This dissonance between pictured-promise and actual dish continues throughout our meal. The Ika Sugata Yaki, presented as a plateful of cuttlefish rings in buttery jus, is actually half-a-plate of cephalopod with a pat of butter on top. Same goes for Kakuni Pork: although obligingly liquid on first bite, the actual dish is much smaller than its print version appears. Fortunately Yakisoba lives up to expectations, the firm wheat noodles a savoury base for a thin, delightfully saucy omelette. Kewpie mayo, and katsu don sauce squiggle bursts of flavour across the egg, crisscrossing a straight line of powdered, kelpy seaweed. The effect is delicious. The Yakisoba is great, but we're still hungry. The food at Fin Izakaya, although tasty, is not nearly as good as it looks in print, and we're hesitant to discover whether future choices will be hits or misses. Instead we call it a draw, pay the bill, and head into the cold, chagrined to find there is more than enough for us all. Small meal/big snack for three, plus tax and tip: $70.